Updated 4:15 p.m. Monday: Tea Party leaders confronted Rick Perry in his own back yard Monday, calling on him to use his power as Texas governor to crack down on illegal immigration. The activists, representing Tea Party groups from around the state, want Perry to either sign an executive order or call the Legislature back into a special session to enact a ban on so-called sanctuary cities. They also want him to eliminate a policy that they say discourages the state police from enforcing federal immigration laws. After holding a press conference about it at the Capitol, the group delivered petitions from more than 3,000 Texans who want the governor to act now. "Gov. Perry needs to clarify his position on illegal immigration, and he needs to come back to Texas and to finish the people's unfinished business," said JoAnn Fleming, chair of the Tea Party Caucus Advisory Committee of the Texas Legislature. "The ball is in Gov. Perry's court. He needs to make a decision. He's running out of time." In mocking tones, Fleming threw Perry's signature phrase "fed up" — the title of his Washington-bashing book — right back at the governor. "We're fed up, too, Gov. Perry, and we're ready for you to take care of this issue," she said. The outcry against Perry from homegrown Tea Party activists illustrates the perils of trying to hold down the job of Texas governor while running for president. It also shows how Perry's relatively moderate stands on immigration are causing him heartburn in the conservative GOP electorate. Perry favors giving in-state tuition to certain illegal immigrants, which has put him at odds with many Tea Party activists. This year, Perry made a crackdown on sanctuary cities an "emergency" priority in recently concluded sessions of the Texas Legislature, but the legislation never passed. Perry spokeswoman Lucy Nashed said Perry still believes sanctuary city policies should be outlawed but did not directly address the question of whether he is willing to do anything about it now, either by calling a special session or issuing an executive order. "We welcome support for efforts to outlaw sanctuary city policies and encourage those interested to communicate their concerns to members of the Texas Legislature," Nashed said. "Gov. Perry already agrees that sanctuary city policies must end." Fleming and other activists who came to the Capitol Monday said they had met with Perry on June 28 about the failure of the legislation and urged him to act. They said they had not heard back from him. Ken Emanuelson, a Dallas-based Tea Party activist, said Perry should at least issue an executive order overturning a Texas Department of Public Safety policy that they say has turned Texas into something of a sanctuary state. Tea Party activists are promising to hold Rick Perry's feet to the fire over illegal immigration. A group of them will stage a news conference at the Texas Capitol on Monday urging Perry to enact a ban on so-called “sanctuary cities,” municipalities where they say local police are required to take a lax attitude toward the enforcement of federal immigration laws. The activists will distribute a letter, signed by more 3,000 people, asking the governor to either call a special session of the Legislature or sign an executive order that would pull Texas law enforcement more into the business of arresting and detaining illegal immigrants, organizers said. They'll deliver the letters to the Texas governor's office — and are planning to send a copy to his presidential campaign. Perry had made the issue an “emergency item” during recently concluded legislative sessions, but opponents blocked it and the bill never passed. It has sparked heated divisions in Texas, where wealthy business leaders — including one Perry's most generous donors — have worked against passage of a harsh sanctuary cities bill. Tea Party leaders say it’s not too late to get a sanctuary cities bill back on the rails. Fleming said the bill could help the governor shore up support among conservative activists who want him to take a tougher stand against illegal immigration. Texas has, by far, the longest border with Mexico among the four states on the southern U.S. boundary. Texas also has deep cultural and business ties with Mexico. Over his long career in Texas politics, Perry has reflected his state's political mainstream by positioning himself as a relative moderate on immigration. He has been a vocal foe of a long border wall, and he said in 2001 he was "intrigued and open" to an amnesty proposal for Mexican workers made by George W. Bush in 2001. 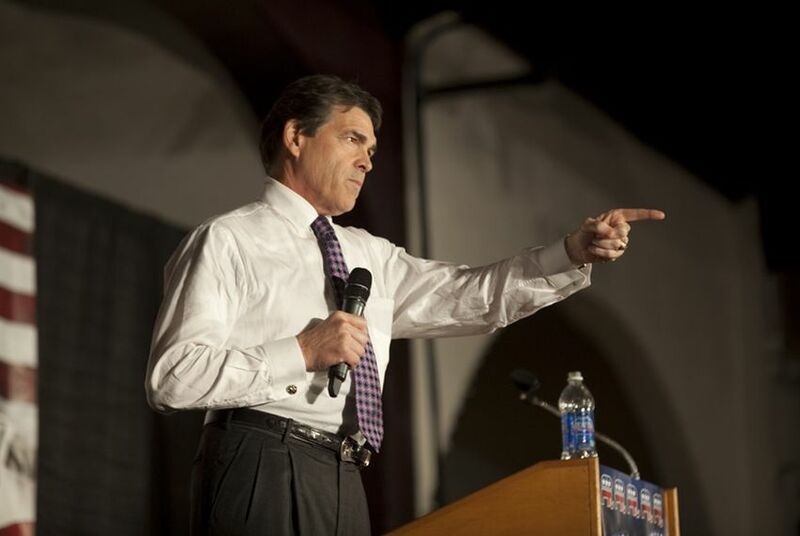 (Perry now favors securing the border before making any federal immigration policy changes). The governor, at the risk of alienating a key constituency in the 2012 presidential race, still favors giving in-state tuition rates to illegal immigrants who graduate in good standing from Texas high schools. Perry signed the legislation in 2001 and says it's the appropriate policy for children who are in this country because of choices their parents made. Perry's chief opponent, former Massachusetts Gov. Mitt Romney, vetoed a similar in-state tuition bill when he was governor of Massachusetts, saying it would provide incentives to illegal immigrants. With his Republican base demanding action, Perry took a harder line in the 2011 session of the Texas Legislature by making a ban on sanctuary cities a top priority. He again took up the cause in a special legislative session, but the bill failed in late June after representatives of prominent businessmen, including home-builder Bob Perry (no relation), got involved with efforts to block or soften the legislation. Bob Perry, a wealthy Houston homebuilder and prolific political donor to candidates nationwide, is one of Rick Perry's largest contributors. GOP leaders engaged in a round of finger-pointing when the bill went down. In an unusual public spat with a fellow Republican, Perry blamed state Sen. Robert Duncan, R-Lubbock; then House and Senate leaders (in a not-so-unusual public spat) criticized each others' chamber for allowing the bill to die before reaching Perry's desk.